* Step 1: Put the squash in a steamer and steam over a medium-high heat for 15 minutes until soft. * Step 2: Preheat the oven to 180ºC/350ºF/gas 4 and grease a baking sheet with dairy-free margarine. Sift the flours, xanthan gum, gluten-free baking powder, salt and sugar into a food processor with the dough blade attached and blend for one minute to mix well. Add the dairy-free margarine and blend for two minutes to mix, then add the soya milk and 75g/2ｽoz of the cooked squash and blend for 10 minutes. It will be very sticky. * Step 3: Dust a chopping board liberally with rice flour. Scoop the dough onto the board and lightly roll it in the rice flour until workable. With the palm of your hand, press the dough out evenly to about 2cm/3/4in thick. Using a 6cm/21/2in round pastry cutter, cut out the scones, reworking the dough as needed. * Step 4: Put the scones on the baking sheet and bake for 20-25 minutes until golden brown. 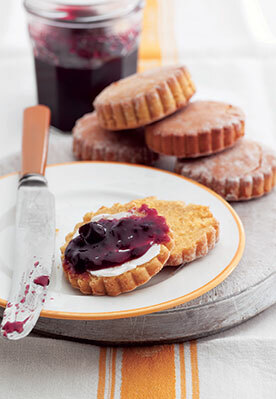 Serve warm with dairy-free margarine and jam, or turn out onto a wire rack to cool before serving.